At Always Affordable Plumbing in Sacramento, we always recommend preventing problems over fixing them after they happen. If you can maintain an appliance or system so that it lasts, then that will save you money and energy, as well as prevent stress in the future. One of the best, but most overlooked, things you can do in this area is drain your water heater. This should be a yearly task. 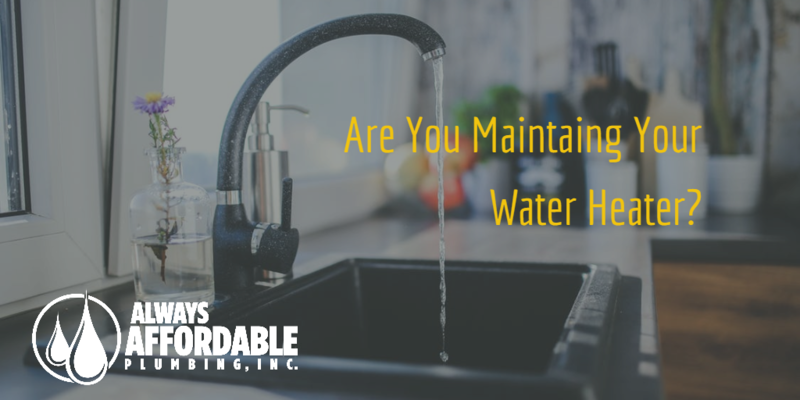 Don’t feel bad if you haven’t drained your water heater lately … or ever. You can always get started now. Water heaters build up sediment as time goes by. As this mineral mixture accumulates, it can make the heater work harder. As a result, this can shorten the heater’s life. In certain cases, it can also possibly plug the pipes. You do not want to do anything to make your water heater unhappy. If it springs a leak, then it has somewhere around 50 gallons to pour out. That much water can do significant damage. To drain your water heater, firstly be sure that anything running to the heater is shut off. This includes electricity, gas, and water as necessary. Flip the appropriate breaker to off. Likewise, shut off any cold-water supply valves. Some people with gas-powered heaters choose to turn them to “pilot” instead of completely off. If you don’t want to work with water heated to more than 100 degrees, give the heater time to cool. To clarify, we’re talking a few hours minimum. Next, take this opportunity to check your heater’s pressure-release valve. Put a towel or bucket beneath the valve before opening it. Whenever you work with water, you should be prepared for drips, splashes, and even pouring or streaming flows. Watch for water coming out of the valve, and listen for a slight hiss of air. Either one is a good sign. If nothing happens, then you may need to replace the valve. After inspecting the release valve, it’s time to turn to the drain itself. Attach a thick hose (one that can handle hot water if it hasn’t cooled) to the drain. Be sure the other end of the hose is lower than the valve. Also be sure it empties somewhere that can handle draining 50 gallons of water. If this isn’t possible, be sure it empties somewhere with a pump. Before opening the valve on the tank, open some other hot water taps near the heater. This creates better flow in the system. Finally, you’re ready for the actual draining! Open the valve on the hot water heater itself and wait. After all the water has drained, then let some new cold water partially fill the tank again. This can stir up any loosened sediment to flush it out, too. You can do this step as many times as necessary, repeating it until nothing but clear water comes out of the hose. When you’re satisfied that your water tank is as clean as it’s going to get, close the valve. Then take off the hose. Lastly, open the heater’s cold water supply valve all the way so the tank refills to capacity. While this is happening, open any other hot-water valve or faucet around the house to ensure the system is working properly. Let them run until the water flows steadily, without interruptions from air bubbles. Once the tank is full, turn on power again to the heater. Waiting is especially important for electric heaters, since exposing the active elements to air can damage them. In a short while, the fresh water will heat up, and you can take hot showers again. Have questions? We don’t blame you. To sum up, hot water heaters can be intimidating. You can call Always Affordable Plumbing in Sacramento any time for advice, answers, and help.